This Easter egg fruit tray is the perfect way to dress up your table for lunch, brunch or even dinner. Serve fresh fruit in a festive way! Best of all the platter I bought was from the Dollar Tree so it was affordable! 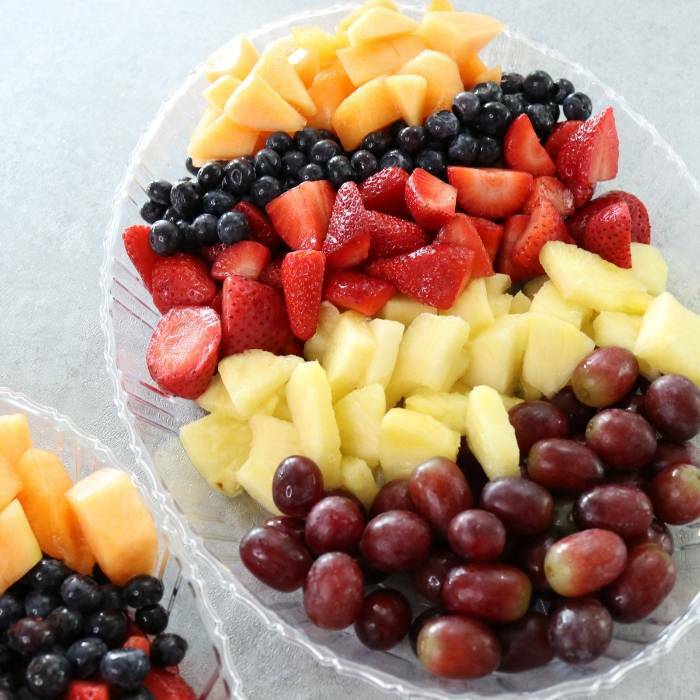 Skip the fruit salad, and create a simple and delicious fresh fruit tray for your holiday entertaining. Let me share how to make an Easter egg fruit tray in a matter of minutes. I picked up a couple of these egg-shaped serving trays I found in our Dollar Tree party section. I am going to use these for making a cheese and cracker platter along with a fresh fruit platter for our Easter party. Affordable, easy, no fuss platters you can assemble ahead of time to pull out from the fridge and serve your guests! 14 Easter Cakes To Make! If you don’t live near a Dollar Tree, you can always look at a local dollar store, or find egg-shaped platters at Target or even Walmart for a few dollars. You all know I have a love for finding a good party and holiday-themed items for cheap at our Dollar Tree! The options for this tray are endless. Meat Platter | Consider toss in some smoked meat, lunch meat for making sandwiches, etc. Cheese Platter | Have a love for cheese? Slice up a variety of cheeses to place out in the display for friends and family. Vegetable Platter | Grab your favorite veggies and assemble in a fun egg shape look. Don’t forget to pair with your favorite dipping sauces. Crackers or Bread | If you are doing sandwiches having a bread platter is always nice. It gives people options for what they might want. Crackers are great to have if you have a meat or cheese platter as well. The options are endless on the type of platter you can create with this Easter egg-shaped plastic platter! When you are done, wash, dry and toss in a cupboard to save till next Easter. It’s an affordable way to give your feast a more decorative design. Absolutely! Slice and prep all your fruit and assemble in the tray. Then wrap in plastic wrap or aluminum foil and tuck in the fridge. When ready to serve remove from fridge and serve! I love having fresh fruit out for holidays. It is a nice sweet treat that can help calm the sugar rush from all the candy and chocolate covered goods. Let me share some fun dippers you might enjoy! Or if you prefer, skip any dips, and just set out the fruit! With the colorful arrangement, it will lure your friends and family in! I simply dice up the fruit that needs to be cut, and prep and wash all the other fruit. Then slowly add in layers of fruit, to give it that Easter egg decorative look. You can pick and choose any fruit you want! These are just fruits that we have on hand and our family enjoys, but feel free to swap it with any fruit that will hold up over time and you enjoy. Fruits like bananas and apples will brown after they are cut for a bit. If you go that route, maybe brush some lemon juice over the top to help from browning. Or skip that kind of fruit and buy fruit that does well at room temperature. Would your family enjoy this Easter egg fruit tray?